Q- How do I open an account? A- C&J is a wholesale manufacturer. We sell to the art and framing trade. To open an account you can email or fax us your company information including Tax ID or resale number if applicable. Please include your billing address, shipping address, phone, email, fax, and name of the contact person. Q- How can I get a price quote? A- C&J will give price quotes only to existing customers with AMCI or C&J account numbers. Please remember that verbal quotes are not guaranteed. You can request a written quote via email. This quote will have a number that you can reference when ordering. Q- How long do frame orders take? A- Most of the frames in our line take 3 to 4 weeks to produce. Special items not in the regular line may take longer. Q- What information is needed when I place an order? A- The Frame number, Finish, and Dimensions. The frame number alone does not indicate the finish. Some of our samples have the same frame number but different finshes. Special finish or carpentry requests must also be specified at the time the order is placed. Q- Can I Fax or Email my order? A- Yes, we prefer that you fax or email. This will help avoid costly mistakes and delays. Phone orders are also accepted but we are not responsible for mistakes on phone orders. We will always provide an order confirmation that you can check for accuracy. If you have questions please feel free to call us before ordering. 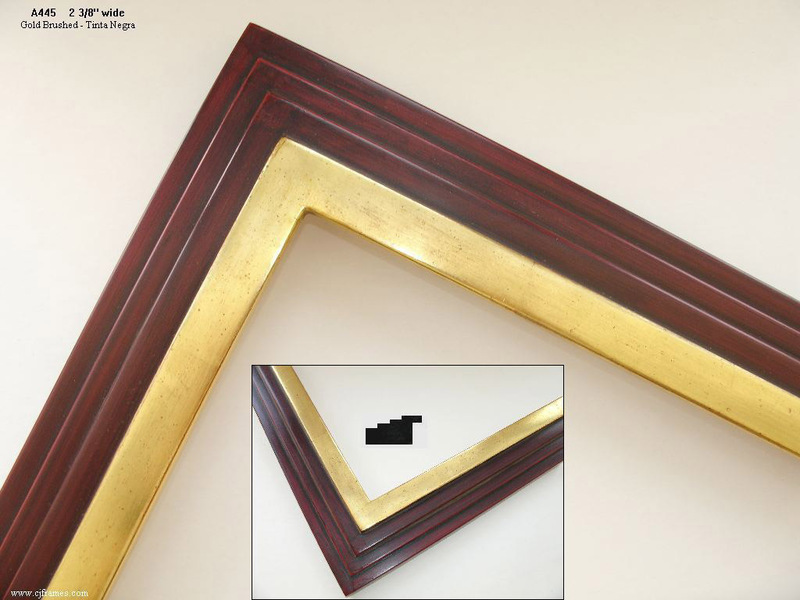 We are always avaiable to provide tecnical assitance or advice on any framing project including help with selecting frames. Q- What if the size is wrong? A- If the frame you receive is a different size from what is on the paperwork, C&J will replace that frame at no cost. The mistake frame will be picked up and returned to us. If the size of the frame does not match your email or fax we will also replace the frame at no cost. With phone orders it's your responsibility to check and make sure the size is correct on the confirmation we send. We CAN NOT replace frames at no cost on phone orders if the size matches the confirmation. Q- When I order a frame will I receive a confirmation? A- Yes. We either fax or email confirmations that will contain the specifications and pricing for your order. The confirmation should always be checked for accuracy. We must be notified as soon as possible if any changes need to be made. Please make sure you have a reliable fax or email address that is checked regularly. Mistakes can be very costly and time consurming. Q- Can I customize the finish on my frame? A- Yes. Since all of our frames are individually made by hand we can customize them based on your specifications. Our finishes are also interchangeable. If you like a finish that's on one sample we can do that finish on any profile we make. Q- Can I receive free corner samples? A- Our samples are very expensive to produce. We can not offer them for free, however we do offer rebates with frame orders. If you order a frame directly from the website you can request the sample at no charge. We also have a half price discount on sample orders of 6 or more with the same rebate offer as full priced samples. Q- How do corner sample rebates work? A- When you order a frame you will receive a rebate for the amount paid on that sample. Q- How do I calculate the footage on a frame? A- Add the 2 sides plus 4 times the width and divide by 6. Round up any fractions to the next half foot. Q- What is your minimum footage on frame orders? A- There is a 5 foot minimum charge on all of our frames. Q- Do you do custom shapes and modified designs? A- Many of our profiles are customized and we can create entirely new profiles to match a sample or drawing. Q- Do you offer a RUSH service? A- Rush service is available when our schedule permits. In most cases we ship rush orders overnight. Please do not request rush service if price is an issue. We do not refund rush or shipping charges for late delivery by the carrier. Normal turnaround time is 3 to 4 weeks for most frames. For hand made frames that will last a lifetime it's not much. Q- Will the frame finish match my corner sample? We do our best to keep finishes as consistent as possible but minor variations should be expected with all hand made work. These variations will not detract from the beauty of the frame. Each frame is it's own unique work of art. Samples age differently over time and can develop their own unique patina. If an exact finish match is required you must let us know and send in your sample. This will help avoid any posible issues with finishes not matching. Q- Can I order a custom Mat or Liner with my frame? A- Yes, we do make custom mats and liners but these are available only with frame orders. They are not sold separately. The last page of our price list has information about these items. Q- Can the rabbet on my frame be made deeper? A- Yes, we can increase the rabbet depth of any frame. The build up charge is listed on the last page of our price list. Q- I need a wider rabbet. Is there a charge for this? A- There is no charge for wider rabbets. Q- What type of gold leaf do you use? A- 22k yellow gold, 12k white gold (Silver) or 18k (Pale or Lemon). This is high quality real gold leaf, not imitation or metal. Other types of leaf are available upon request. Q- Do your frames require any special care? A- If needed they can be cleaned with a dry cloth or feather duster. Never use anything wet, never use furniture polish or any type of cleaning product. Our frames should not be kept near a radiator or kept outdoors. Q- What is the Tinta Negra finish? A- Tinta Negra is a black ink finish with red undertones. This finish has 3 shades from lighter to darker. Tinta Negra, Dark Tinta Negra and Dutch finish. There is also a Dark Tinta Negra with Red Edges finish. The Tinta Negra finish will show more red, and the Dutch finish will show the least. Q- Can any frame be made into a floater for a canvas? A- Yes, we can add a custom floater to any of our frames. The cost for this service is listed on on the last page of our price list. Please specify the depth of the canvas when ordering. Q- Are your prices listed in my framing software? A- We provide pricing information for the software listed below. Q- How do you ship frames? A- Frames are shipped via UPS up to size limitations. Larger frames require foam lined wooden crates that will carry an additional cost. Q- Do you ship COD? We can ship COD via UPS only. We cannot ship COD via truck. We recommend you use a credit card instead of COD. It will also be less expensive. Q- Can I use my own freight company? A- Yes, but in this case we would not be responsible for any damages. You would need to insure the package and file any damage claims directly with your freight company. Q- What is your credit policy? A- COD, or Credit Card. Net 10 day terms can be established by filling out our credit application. First time orders are Credit card ONLY. There is a 1.5% monthly finance charge for past due invoices over 35 days. Q- Will I receive my invoice in the mail or with the frame? A- Our invoice will be on the box in a pouch unless the shipping address is different from the billing address. If this is the case the invoice will be mailed or emailed. If your invoice is lost you can request a copy. © 2019 C&J Picture Frames Inc..